The only thing Facebook has really missed is email and lucky for them, email is mostly dead. Today Facebook hit another all-time high and is worth $238 billion. Facebook owns a lot of our digital history and wants to own the digital future. They have acquired a genetically better Kodak (Instagram), a genetically better ‘Ma Bell’ (Whatsapp) and potentially, your personal Disney (Oculus). Facebook (at $238 billion) has also knocked out Walmart to become a top 10 Market Capitalization Company. What a spectacular achievement for Facebook. 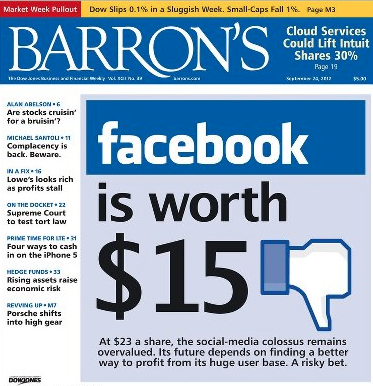 In September 2012, Barron’s (a Dow Jones Company) trumpeted that Facebook was worth $15/share. In September 2012, I also was down on Facebook. So much so that I bought the stock as a ‘stupidity’ hedge when it cracked $20. Here is the moment on my blog. The stock never made it to $15 and that was indeed the bottom . My stupidity hedge worked, but I still flipped the stock out over the next few months in the 20’s. I was not bearish just felt a large quick profit was all Facebook was worth to me. Today, I don’t own it, but I should. My wife Ellen asks me to buy it every week. I likely will. One Company that Facebook might have their eye on to attack the future of email and work productivity is Slack. Facebook has tried their hand at email and failed. The good news for Facebook is that email is broken. We can’t live without it, but don’t want it in it’s current state. ‘Facebook for Work’ is supposedly a big push for Facebook as they attack the enterprise, but I would not be surprised to see them speed things up here with a Slack acquisition. I intend to go deeper into Slack in my next post. The staggering numbers seen today only raise the stakes into the trillions for Facebook, Google, Apple, Amazon, Salesforce, Oracle, Microsoft, even Netflix. I know I left off Twitter, but they are being run over at the moment. The competition for this digital future is also more global than anyone can imagine. en..seems that i am outdated…why i feel facebook is not a must while twitter and gmail are. Their playbook isn’t totally done playing, but I personally wouldn’t bet on them going into Slack territory. Just my hunch, at least for the rest of 2015.